I have added 123 screencaptures from Episode 3.22- De-Void to the gallery. Click the thumbnails to see them all. The folks at E!Online have given us 5 things that we can look forward to in tonight’s episode. One of those things is Tyler getting to stretch his acting chops with a side of Derek we’ve never seen before. 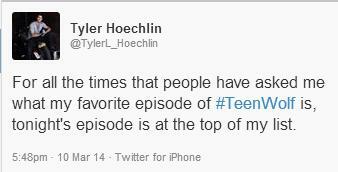 And as we stated earlier, tonight’s episode is one that Tyler has said is one of his favorites. He posted this tweet tonight. At Days of the Wolf, Tyler told us that his favorite scene for Season 3b is with JR Bourne in tonight’s episode, De-Void. Be sure to watch, and also stay tuned after the episode to see Tyler and Ian Bohen as guests on Wolf Watch. Earlier this month, Ian shared this fun photo of himself and Tyler with host, Jill Wagner from the set of Wolf Watch.